For aspiring migrant workers, one of the things that could be done while looking for job is to enrich your skills particularly your ability to communicate well in foreign language. Some of the countries where there are many work opportunities for Filipinos are, Singapore, Hong Kong, Japan, Taiwan, Middle East, like Saudi Arabia, Qatar, UAE, as well as America, New Zealand, Australia, Canada and many other countries in Europe. Hence you can choose to enrich your skills in English language, Japanese, Chinese or Spanish. Where ever you may choose to work, a skill in speaking or communicating in foreign language will always be an advantage. 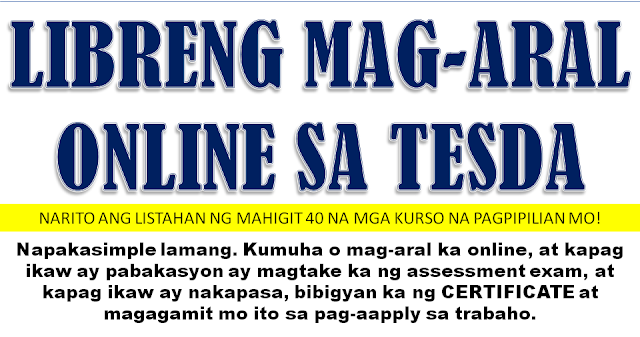 TESDA or the Technical Education and Skills Development Authority offers several language courses to the public FREE of charge. Now you could enrich your language and communication skills by taking courses in English Proficiency, Japanese or Nihongo, Mandarin Chinese, Arabic and also Spanish. Having additional language skills could give you additional credential too when you apply to work in countries that speaks the language or when you apply as call center agent. Language Skills Institute (LSI ) serves as TESDA’s facility for language programs specifically for workers intending to work abroad. The LSI conducts training on workplacecommunication on the language of the country of the worker’s destination. There are 35 LSI nationwide offering different language courses which include English, Korean, Mandarin, Japanese and Spanish. Korea-Philippines IT Training Centers are grant-assisted projects from the Government of the Republic of Korea. These KPITTCs are located at the Polytechnic University in Novaliches, Quezon City and at the Regional Skills Development Centers in Guiguinto, Bulacan and Tibungco, Davao City, respectively. 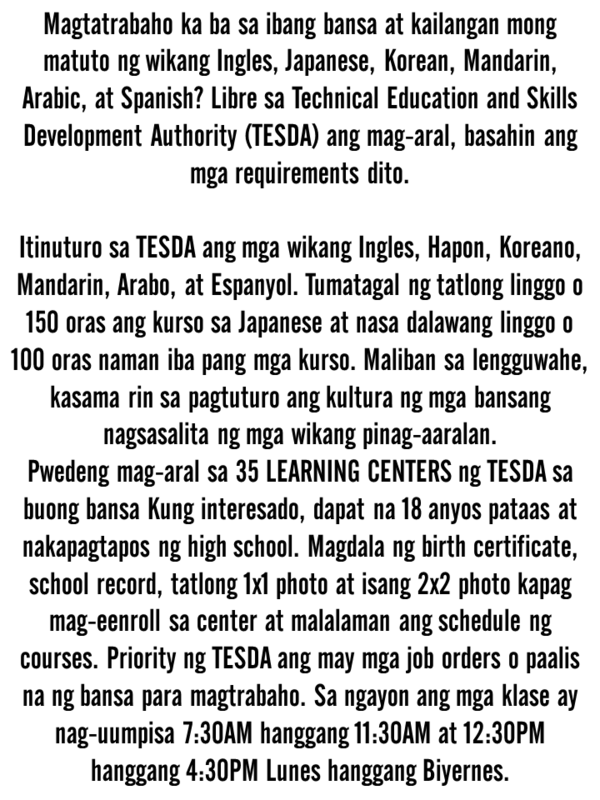 If you would like to avail these free language courses you needed to submit the following to the TESDA Language Skills Institute listed below.